Facebook’s conversion pixel is a key way for savvy advertisers to figure out how a Facebook ad can lead to a purchase. Now it seems like Facebook is trying to make a bigger push for adoption. As noticed by Inside Facebook reader Matteo Gamba, Facebook is promoting the usage of the conversion pixel in the sidebar of News Feed. Facebook has been making use of the sidebar a lot recently to appeal to advertisers. 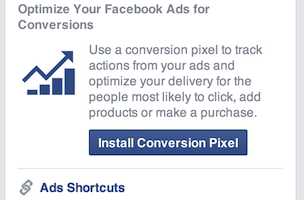 Clicking the Install Conversion Pixel link leads to a Facebook for Business post about the conversion pixel.